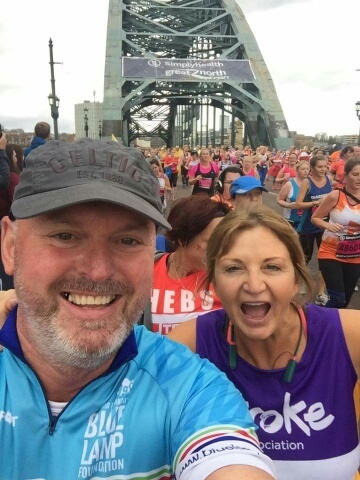 Following the Simply Health, Great North Run, our patient Lesley Calder got in touch to share her ‘couch to half marathon’ journey. “Newcastle Sports Injury Clinic physiotherapist Ben got me from ‘couch to half marathon’ in just over three months. I decided to run the Great North Run half marathon after my mother had a stroke at Christmas 2016. I’d visited the Newcastle Sports Injury Clinic earlier when I had tore ligaments in my foot after a fall. Ben helped me get back on my feet – quite literally. I didn’t give myself enough time to train really, and had NEVER run before – but was determined. With sound, sensible, realistic advice about my training, excellent treatment and massage, and a recommended exercise regime – I built strength and confidence. My training and approach was better planned and achievable. The treatment and exercises managed my pain and discomfort and built strength where I needed it. I RAN the Great North Run, 13.1miles. It was incredible. I would not have been able to achieve it without Ben and the Clinic. They got me over the line and I’ve learned a lot about my body – what to do – what not to do. I cant recommend them highly enough.